Mr. Norphel is a retired civil engineer from Ladakh. 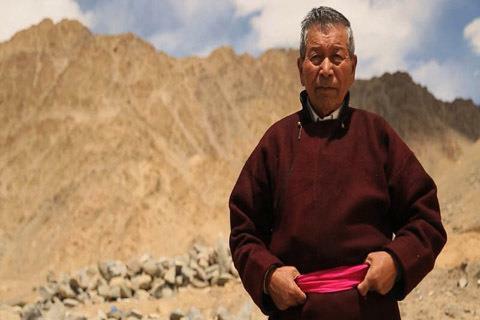 He is popularly known as ‘Ice Man of Ladakh’ as his innovative method of water conservation by creating artificial glaciers has helped many villages in this cold and dry desert. Years back, on a harsh winter morning in Ladakh in the northernmost Himalayas in India, a young and curious boy in a remote mountain village of the cold desert observed water coming out of a semi-frozen pipe, collecting in a small crater on the ground and freezing, just like a glacier. A few decades later, in 1986, the boy, Chewang Norphel — as a civil engineer with the Jammu and Kashmir Rural Development Department — took inspiration from his childhood observations and made a breakthrough by devising the first artificial glacier in picturesque Leh, thereby solving a water crisis faced by the local community, of which at least 80 per cent were farmers growing barley and wheat. Spurred by the success of his experiment, he went on to create 17 such artificial glaciers across Ladakh, thereby earning his nickname — “The Ice Man of India”. Most of his projects received financial aid from several state-run programmes, the army and various national and international NGOs. Now an 80-year-old source of inspiration, Norphel’s journey was not easy, as people initially used to laugh at him and called him “pagal” (crazy). But that did not deter him as all he saw was a grave problem which needed a solution that he could provide. “Ladakh has a distinct climate where you can get frost bite and heat stroke at the same time. About 80 per cent of the population consists of farmers and their biggest issue is unavailability of water at the time of sowing in April-May because glacial streams are frozen and rivers flow way too low to fetch water,” Norphel told this visiting IANS correspondent. Sitting in his living room full of plaques and awards, and overlooking a lawn that he has converted into an agricultural haven, Norphel said rivers are the main source of fresh water, but since they flow at lower altitudes, they are hardly of any use to villages at relatively higher altitudes. 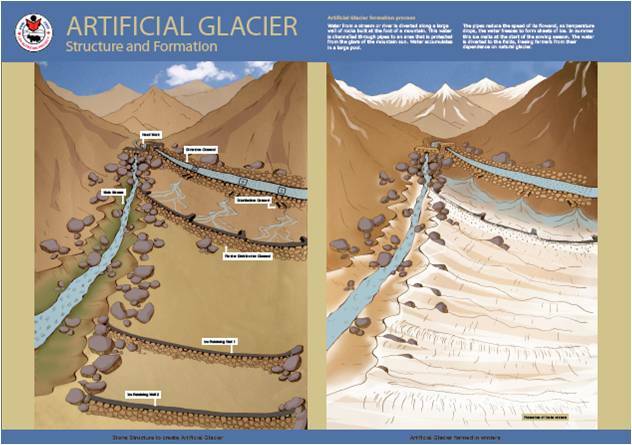 Graphical representation of how an artificial glacier works. “So we built those glaciers near the villages,” said the “Ice Man” who was awarded the Padma Shri award in 2015. He was also recognised for his achievements by the United Nations Development Programme (UNDP) in 2011. Winters are severe in Ladakh due to which there are no winter crops. Whatever water flows during this time is wasted while during the sowing season, there is hardly any water available because natural glaciers, situated some 5,000 feet above and 20-25 km away from the villages, only melt after June. “So I thought: What if there were glaciers at lower altitudes which would melt sooner due to relatively higher temperature? Thus came the idea of artificial glaciers. “It’s a technique to harvest winter waste water in the form of ice. And by creating artificial glaciers at relatively lower altitudes, it was possible to get water when it was needed,” Norphel said. The work to construct a glacier starts in October when the villagers divert the glacial streams, and create embankments in the form of steps to slow down the velocity of water. “We assure that the depth is kept only a few inches, so that it freezes easily,” he said. Norphel has built glaciers at the toughest terrains in Ladakh including one at Dha, the native village of the Brokpa tribe which is renowned in the entire region for their distinct culture and their role during the Kargil war. But close to his heart is the 1,000-feet-wide glacier that he built at the Phukte valley which supplies water to five villages. The glacier was built at the cost of approximately Rs 90,000. Norphel said that the cost of an artificial glacier today could go up to Rs 15 lakh, depending on its size and capacity. Norphel recalled how everyone laughed at him, calling him mad when he was making his first artificial glacier in Phukte village. Since it was something that had never been done before, he had to work like a crazy person, albeit with a really good plan and immaculate calculations. “No one would take me seriously; today they all are benefited. These glaciers are my pride and the fact that my concept has helped so many people gives me peace of mind,” said the humble old man, rarely seen without a pleasant smile on his face. Retired from his government post in 1994 after 34 years of service, Norphel doesn’t believe in sitting idle. If he is not travelling for work, making new glaciers or inspiring the youth, he is either seen meditating in his room, spending time with his wife or in his kitchen garden where he experiments on how climate change can be used for the benefit of community by growing vegetables otherwise cultivated in the plains like turnip, brinjal, capsicum and cucumber. A hero for those who know him, Norphel wishes he had more energy at his age. “Earlier I was full of energy; now I think old age is taking over. Now funds are available, but not the energy… I want youth to take over; they are practical; I want them to practically understand climate change,” he says. His house is thronged by students from all over the world. At present he is assisting several NGOs in replicating his concept across the cold desert, including the high altitude Changtang district and the low altitude regions where there’s lack of at least one of the three elements needed for better agriculture — land, water and right temperature. “Changtang region has land and water, but not the right temperature as it’s very cold. Leh has land, right temperature, but not water. And regions below Leh have water and the right temperature but not enough land. We have to make the best use of resources and techniques,” he says with enthusiasm, eager to embark on a new journey of challenges. Norphel feels that India needs to replicate Israel in the agriculture sector. “In Israel, they have less water, unsupportive temperature and limited land, yet they have very good production. We want to create something like that here,” he said. He sees both the positive and negative aspects of climate change and believes in making the best use of them.